Applied Archaeology and Museums – The Course. This past semester I was the instructor for my favorite course – Applied Archaeology and Museums – a joint undergraduate and graduate class that usually enrolls 15-20 students. I developed the course a few years ago as pretty much an amalgam of what I enjoy and am most passionate about in archaeology – community engagement and empowerment through cultural heritage studies. There are no in-class exams. Instead, students complete a series of essays, reading journals and projects where they directly apply the course content to real-time situations. For example, students write a brief essay on repatriation, as applied to the Elgin Marbles. In the past I used a brief article by Jarrett Lobell from the 2006 edited volume Archaeological Ethics. Now as the lead resource I use the Wikipedia article on the Elgin Marbles, a 5000-word piece based on over 70 references. I am not aware of a more up-to-date and comprehensive starting point for the single class Elgin Marble repatriation discussion. Using the Wikipedia page also allows for students to assess the worth of user-generated content. I emphasize that there is not a right or wrong position on repatriating the Elgin Marbles. I enjoy that depending on the class composition of Anthropology, History, and Art History majors, the discussion is quite varied. Occurring within the first two weeks of the course, I intend for this discussion to set a tone for the diversity of possibilities throughout the semester. Forty percent of the course grade is from the final project that students complete for the class. I offer several possibilities and past projects to help stimulate the students thinking. The criteria for the final project includes that it must be broadly based in archaeology or cultural heritage studies and must ultimately live in area museum. The projects were particularly successful this past semester. I will post some of them here over the next few weeks. What is the social utility of archaeology? Does Archaeology have a viable utility for people beyond other archaeologists? What is the most significant insight you obtained from the course? Explain. My reason for asking this line of questioning flows from my first field school experience nearly 30 years ago. 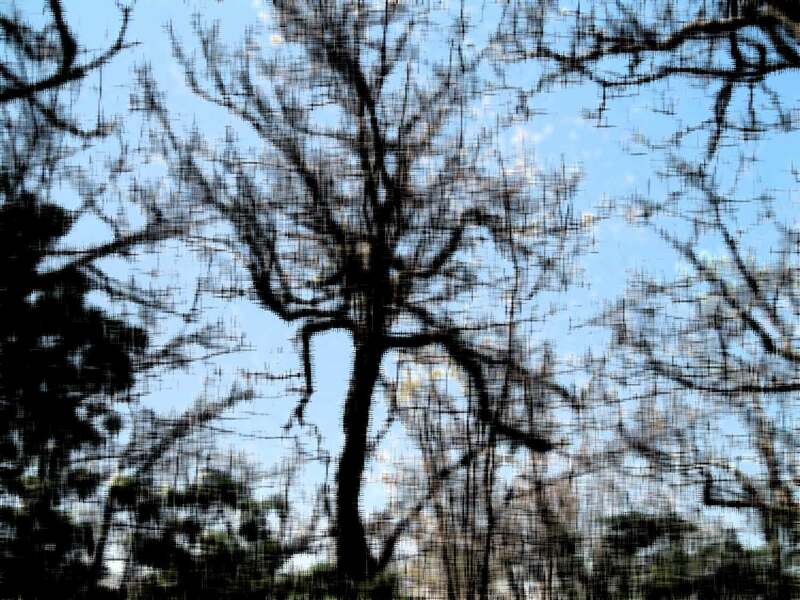 The instructor, the late Dr. Patricia Essenpreis said something like “If you cannot explain to the public why their tax dollars should go to support keeping this site open to the public, you might as well go home.” I pondered that mandate for many years. Quite honestly, I don’t think I was ever able to adequately respond until I worked in applied archaeology contexts where community members were creating exhibits around their own cultural heritage. I believe that it is critically important that our students be able to show that archaeology is relevant, not just in the classroom, but when they leave as well. 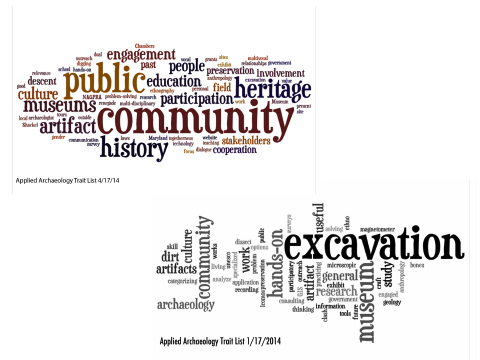 Finally, the two wordles below are from spontaneous/unannounced two-minute trait list exercises for the term “applied archaeology” students completed on the first and the last day of class. I am not completely comfortable with the shift over the course of the semester. I appreciate that “excavation” is not the predominant associated term at the end of the semester as in the beginning. On the other hand, I am surprised that the concept of fieldwork is nearly absent in the final list. I am pleased that by the end of the semester students appreciate that applied archaeology is a discipline that is not performed for but rather with the community.